These downloads are ZIP files containing Panasonic firmware upgrades. Most files have the extension ".img" with several ".bin" files of the same name. Refer to the date in the file name to ensure that you have the latest version. All new individual files will be replaced with the latest ones as they become available. It is best to remove all old files before extracting the new ones. Individual updates will still be maintained on the "Panasonic 1-Click" menu. Check the file date, only those that have changed need to be downloaded. Create a folder on your desktop (our preferred location) called "Panasonic Firmware" and save the ZIP file from the link below into the folder just created. Extract all files in this location. When using the Panasonic i-Pro Admin Console software, point to this directory. Click here to view a short video instruction: Demo Video: Firmware updates on i-Pro. NOTE: Be sure to match the image file to the camera model before applying it. Some cameras, such as the WV-SP509/WV-SW559 and the WV-SF549/SP539, both use an image file with the name "sp_509_xxx.img" Refer to the Panasonic 1Click menu link for the correct version. 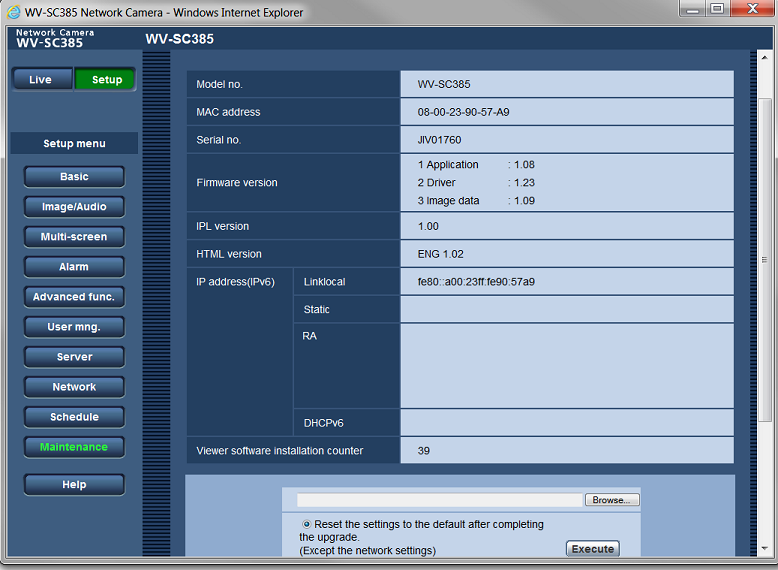 NOTES: Several models of the newer cameras (WV-NW502, WV-SC384, and WV-SC385 to date) have two files each. One has the extension ".img" and is the firmware version (shown as item '1. Application') in the screen shot below. That will be the same as the version number listed in the update filename - in this case 1.08 and the file used is 'sc385_108E.img'. The second file has a ".bin" extension which is listed as '2. Driver' in the screenshot - here it's listed as 1.23 and the file name is 'sc385_123.bin'. The bin file is NOT updated by the i-Pro Admin Console at the present time. Please check the installed version by looking in the camera's Maintenance section, Upgrade tab. The img file and the bin file will not have the same number - bin files are not changed very often. If needed, use the Upgrade tab to install the bin file manually.